Zoroaster’s father was the venerable Porushaspo and his mother Dughdhvo. Zoroaster was born in the west of Iran in Takht-e-Suleman in the district of Azerbaijan. He was a direct descendant in the royal line of the house of Manushcihar, the ancient King of Iran. Zoroaster’s family name was ‘Spitama’, which means ‘White’. Zoroaster had two elder brothers and two younger brothers. Zoroaster married three times and had many children. His first wife had one son and three daughters. The youngest daughter Pourucista married Jamaspa, who was the uncle of Zoroaster’s third wife. Zoroaster had two sons by his second wife. Several archangels helped Zoroaster in the spiritual path. Archangels are divine messengers of the highest order. They are the attendants of Ahura Mazda. They correspond to the Siva-Ganas—the attendants of Lord Siva;—and to Jaya, Vijaya, Nanda, Sunanda, etc.—the attendants of Lord Vishnu. They are the guardian-deities or the Lokapalas of the world. Zoroaster had direct conversation with these archangels. When Zoroaster was coming down from the celestial abode of Ahura Mazda, he was terribly attacked by the evil force Ahriman, the Satan of Zoroastrianism. Ahriman wanted to kill Zoroaster, but Zoroaster’s spiritual powers saved him. The Prophet became the master of all demons after conquering Ahriman. He began to preach again. 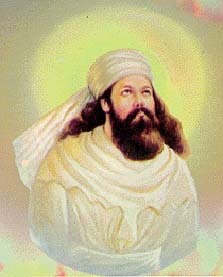 Zoroaster was pious, noble and compassionate. His message was the noble message of high moral life which paves the way for the attainment of immortality and eternal bliss and the doctrine of the God of Righteousness or Ahura Mazda. "Love the righteous. Have compassion for the distressed. "—These constitute Zoroaster’s main ethical teachings.